If you’ve experienced pregnancy loss or have been uncertain what to say to a friend who has had a miscarriage, the new campaign from the Miscarriage Association will be welcome. They’re aiming to help people respond to someone who has been through a miscarriage or an ectopic or molar pregnancy. Often people are so worried about saying the wrong thing that they end up trying not to talk about the miscarriage at all, which isn’t a helpful response. The Miscarriage Association campaign is called Simply Say and aims to make it easier for people to have the conversations that they sometimes avoid. They are encouraging family, friends and colleagues to acknowledge the loss and then to listen, and the campaign aims to help them to know what to say – and what not to say. The charity has spoken to women and their partners about the things they’ve found helpful and the things that can be particularly upsetting. They conclude that everyone is different and that it can be hard to find the right words to comfort someone, but acknowledging their loss is one way that you can help anyone who has been through this. Simply saying that you are sorry is one of the most important things you can do. The things that can be particularly upsetting are well-meant comments which aim to put a positive spin on the experience – for example “Don’t worry, you can always have another baby” or ““It wasn’t meant to be”. For people who have had a miscarriage after spending some time trying to get pregnant, it’s the “well, at least you know now that you can get pregnant” comments which can be really hurtful. Although people may just be trying to find something positive to say, it is particularly unhelpful when you may feel that you don’t know if you will be able to get pregnant again. 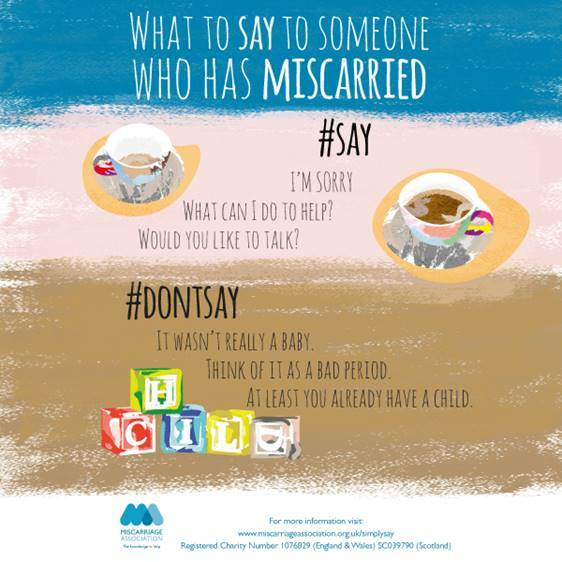 The Miscarriage Association have produced an animation and infographics as well as a downloadable leaflet with more detailed information, and you can get involved in their #SimplySay campaign on social media. Do support this important campaign! This entry was posted in miscarriage and tagged #simplysay, ectopic pregnancy, miscarriage, miscarriage after infertility, Miscarriage Association, molar pregnancy, Simply Say by fertilitymatters. Bookmark the permalink. Thanks so much for helping us to spread this message. We’re conscious of the special circumstances of those who experience both fertility problems and pregnancy loss – a double blow, and one which requires real sensitivity and support. Thank you Ruth – it’s a brilliant and much-needed campaign and I hope it is a huge success.